Although my husband does not wear much jewelry, he does have a weakness for watches. I would say he ends up replacing his once every year or two even if it is still fully functional. For this reason, I rarely shop for men's watches in-store. I usually am able to find exceptional prices online, as well as a wider assortment of styles. Orient, which have been featured on People.com, The New York Times, Men's Fitness, and ShopNBC, offers a wide range of watches to fit every style and budget. Their selection includes professional, urban, and sporty watches, such as the Orient Mako Diver. Diving watches are the ones that usually catch my husband's eye. You can purchase Orient watches on OrientWatchUSA.com, as well as on Amazon.com and other select retailers. To learn more about Orient watches, visit www.OrientWatchUSA.com and the Orient USA blog. 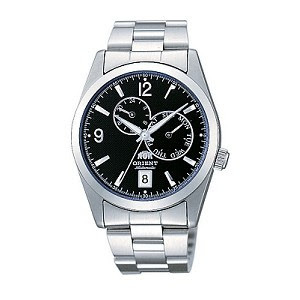 Take a look at the assortment of watches for men offered by Orient . Then leave a comment telling me which watch would you love to present to a man in your life. You MUST do this to be eligible to win this contest. 3) For 10 extra entries, blog about this contest linking back to this post AND OrientWatchUSA.com . Then come back here and leave TEN separate comments with the link to your blog post.